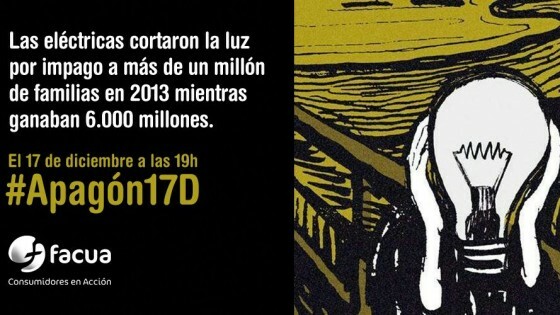 Bajo el lema #Apagón17D, FACA reclama al Gobierno una batería de medidas. Así, exige el fin de las puertas giratorias por las que altos cargos gubernamentales, entre ellos ministros y presidentes del Gobierno, acaban como consejeros de las empresas energéticas y viceversa. Desde el campo de la Responsabilidad Social los expertos llevan años analizando y alertando sobre los escasos compromisos que en el sector de los grandes oligopolios relacionados con la energía se están adquiriendo. Con la crisis económica, conceptos como la “pobreza energética” (cuando algunas capas de la sociedad es incapaz de cubrir sus necesidades básicas por el aumento del precio de la electricidad) están sonando con fuerza sin que estas multinacionales hayan implementado medidas para frenarla. FACUA anima a los usuarios a fomentar la participación en el apagón. Para ello pueden grabarse con sus móviles o tabletas (http://facua.org/apagon17D/2014/12/04/grabate-con-el-movil-y-difunde-tu-apoyo-al-apagon17d/) para explicar por qué se suman y difundir los vídeos en las redes sociales con la etiqueta #Apagón17D. Numerosas personalidades del mundo de la cultura han comenzado a hacerlo y sus vídeos podrán verse en la página web del apagón. 5. Porque nuestros últimos gobiernos han incumplido la directiva europea que obliga a garantizar tarifas “razonables”. Under the slogan # Apagón17D, FACUA demands to the Government a wide range of measures. The main demand is to stop a preferential treatment provided for the senior Government officials, including prime ministers and government leaders, which become directors of energy companies. The experts of Social Responsibility have spent years analyzing and warning of that few commitments in the field of the energy oligopolies. With the economic crisis, the concepts like “energy poverty” (when some levels of society are unable to cover their basic needs by increasing of the price of electricity) are becoming more popular in spite of the fact that these multinationals have implemented measures to stop it. FACUA encourages the users to participate in the blackout. They can make a video with their mobile phones (http://facua.org/apagon17D/2014/12/04/grabate-con-el-movil-y-difunde-tu-apoyo-al-apagon17d/) explaining why they are joining and sharing the videos in the social networks with the tag #Apagón17D. A lot of famous personalities of the world of culture have begun to do this and you can see these videos on the official web of the blackout. Because the governments that liberalized the electricity sector lied by promising that the price would go down. Because for the average user the electricity rates have increased by 72% just in ten years. Because the companies are deceiving millions of consumers with false discounts to procure services that in reality increase the average bill by 14%. Because in 2013 Iberdrola earned 2.572 million, Endesa 1,879 and Gas Natural Fenosa 1,445 but they still applying an excessive rates. Because our previous governments have failed the European directive of the “reasonable” rates. Because the government does not fix the rates basing on the real cost of electricity. And that real cost is a big secret. Because the presidents and ministers who privatized and liberalized the sector are paid from this sector now. Because we pay 6,000 million for the costs of transition to competition which has never existed. Because the oligopoly can not fixe the rate of such an essential service like electricity. 10. Because during the last year the government allowed to cut off the light for more than one million families that had no money to pay. Esta entrada fue publicada en Consumo, General, Responsabilidad y etiquetada pobreza energética, responsabilidad social por Símbolo Ingenio Creativo. Guarda enlace permanente.